Marketers tend to think about suppression lists as the means to an end. Suppression lists make it possible to practice CAN-SPAM compliance, right? That makes them useful, but not exactly exciting…until you discover that suppression lists actually carry a lot of profit potential—apart from their role in handling opt-outs. Today, more retailers are discovering brand-building opportunities that come from the ability to suppress or exclude specific contacts at different email marketing junctures. Ready to be surprised? 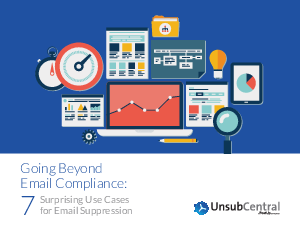 Download our e-book to find 7 interesting use cases on why suppression lists should go beyond opt-out lists and how to use your suppression list to increase ROI.